The three dashboard platforms listed below provide free versions that access MS Access data. The products listed below all need licenses to operate. 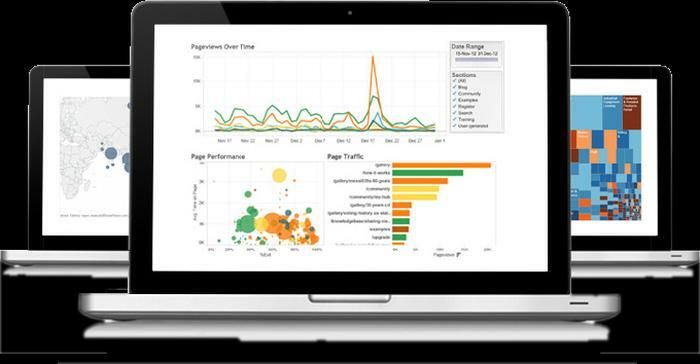 Tableau users can start with the free Tableau Public. This supports the creation of attractive visuals specifically with web publishing in mind. The enterprise version of Tableau is called Tableau Server. This is a in-house hosted version accessed through a web browser, and supports the features usually found in a product of this nature – dashboards, graphs, charts, tables and so on. Tableau Desktop runs on PC and Mac and can process data in local memory and/or go to other remote data sources. Tableau can also be accessed as a cloud service. Visual Mining NetCharts Performance Dashboards is an interactive, web-based dashboard, business intelligence and data visualization solution designed and architected to empower non-IT business users. Nearly all aspects of dashboard key performance indicator (KPI) creation and management are configurable by end users eliminating the IT bottleneck in most reporting processes. NCPD provides business analytics and Key Performance Indicators (KPIs).